1. What is a pun? 2. The woman has no problem buying a large number of super-sized pork products (the groceries she likes), but when her child asks for one smaller box of something, she angrily says she doesn’t have enough money to pay for it. Almost all members of Congress take advantage of pork barrel spending – they add “pork” to bills. Businessdictionary .com defines pork-barrel spending as: the act of using government funds on local projects that are primarily used to bring more money to a specific representative’s district. Basically the politician tries to benefit his/her constituents in order to maintain their support and vote. 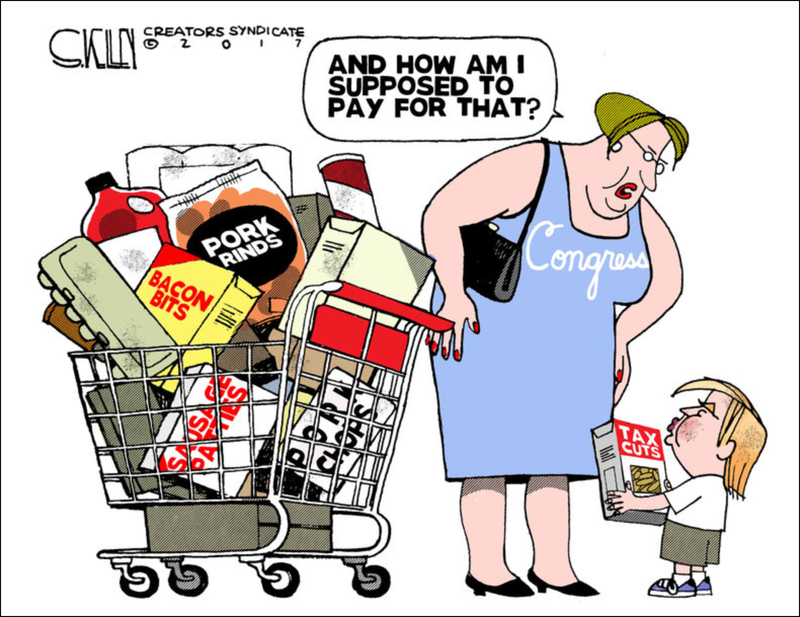 Cartoonist Steve Kelley is implying that Congress has no problem using taxpayer money for their pork spending, but when the president wants to cut taxes to help taxpayers, Congress says they can’t afford to lose any of that revenue.